Our subscription options include Basic, Premium, and Advanced. Consider your monthly budget, as well as the health needs of your family, and choose among our subscription options to find the option that is best for you. Our Basic air filter delivery blocks most common household allergens like dust, lint, mites, and pet dander. This option is the most economical for families on a budget. The Premium filter subscription service filters the same household allergens as the Basic plan, in addition to smoke, smog, bacteria, etc. 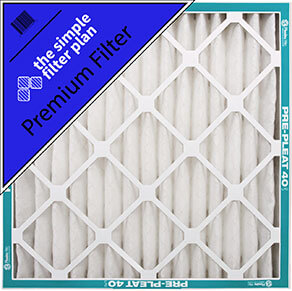 This is our most popular air filter subscription option for its ability to filter allergens as small as 1.0 microns. The Premium plan is recommended for pet owners, allergies, families on a budget, and the average suburban home. The Advanced filter option is by far the most advanced filtering option, blocking out lead dust, oil smoke, and microscopic allergens in addition to other household allergens and environmental pollutants like smog and smoke. Thorough enough for hospitals, the Advanced filtration option for sensitive allergies, pets, or the standard urban or suburban home. After choosing the best AC filter delivery plan for your needs, you can choose your delivery options. You can choose a monthly option, which is perfect for keeping allergies at bay, families with multiple pets, or families who require extra clean air. You can receive your filter delivery every two months, which is perfect for families for one pet, and families living in a city. Every three months, you can also have an air filter delivered to your home. This is the most budget-friendly option, recommended for the average suburban home. Choose the air filter option you most prefer, then look through the filter delivery options you most prefer. Contact us to learn more about our delivery and filter options, or learn more about Simple Filter Plan! you get answers when you need them. Air Filters delivered to your door, right when it's time to change them. It doesn't get any simpler.